Today I’m going to take you on a little journey of how my blog name came about. When you read my blog name you might just think I stole a quote from Walt Whitman because I liked it. Well, now that I think about it that might be partially true but there’s a lot more to the story. See, I wasn’t born in America. I was born in Sao Paulo, Brazil to American parents, who were missionaries. My grandparents and other family members weren’t in Brazil when I was born and to meet me they had to buy a plane ticket and travel a long way. When my granny came to meet me, my crib was solid wood with a heart cut out of it. She said the first time she met me I peeked through the heart and gave her a huge smile. She replied with ‘you're my sunshine girl’. When I moved home to America my granny and I spent lots of time together and she always would tell me that I was her sunshine girl. Even now, she still tells me that I'm her sunshine girl and I love it! I don’t remember this, but my Dad told me my grandpa would pull me around in a little wagon while telling me I was his sunshine girl too. Later in life my Mom got in on this too. She bought me a magnet and a computer bag that had the ‘Sunshine to the Square Inch’ quote on it. Also (and I don’t say any of this in a bragging way) God has given me a huge extra dose of energy and I have to share it! I love love love brightening people’s day by visiting with them, sending cards, care packages, e-mail etc. The extra dose of energy can be good and really bad depending on how I channel that energy. Either way though I see it as a gift that I have to share with others. On a spiritual level though, I picked my blog name because I want to share 'The Son' to the square inch. I really want my life in every way, including my blog, to be a reflection of Jesus. I have a deep desire to encourage missionaries, a deep desire to go to the mission field someday and serve, a deep desire to share about Jesus and His love for us and a desire to encourage people wherever I’m at. I've had opportunities right here in Oklahoma to serve that I never dreamt about. I can honestly say that giving to others has in turned blessed me more. I also know that no matter how my lovely blog name came about without readers it wouldn't exist. I've recently put some work into promoting this blog and I've seen some growth. In honor of that growth I'm hosting a thank you giveaway. To everyone who follows my blog, has read a post here and there this giveaway is for you. Thank you! Thank you! Thank you for supporting me on this journey. 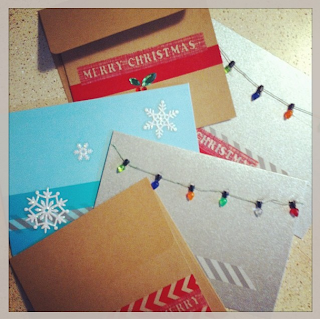 I'll be giving away a Christmas chevron canvas as well as 3 Christmas cards all made by me. The canvas measures is 11x14, can be hung or set an on easel and comes with some special stickers that you can attach a photo to the canvas. Along with the canvas I'll be giving away 3 Christmas cards. The winner will be verified and will have 48 hours to respond. If no response is received I will pick a new winner. This giveaway is open internationally. My favorite Christmas present was diamond earrings from my now husband. My favorite Christmas present is the Chocolate Lab puppy that I got last year. I love her to death! My favorite Christmas gifts are generally "experience" gifts - such as going out to dinner with a friend or seeing a play with my parents. There's something extremely special about spending time with the people you love! LOVE insightful meanings behind blog names. I mean, they are the very FIRST thing a reader sees, so having it pack a powerful punch is so important! Very cool. My favorite Christmas present was my violin. It was a huge surprise. I remember going into the closet and crying my little 8th-grade heart out because I was so happy. P.S. Love the story of how your blog got it's name. Your spiritual gift really shines through! Love it! We really need to plan a meet-up sometime. I loved hearing the story behind the name! :) I've really enjoyed your blog and seeing your love for God and others! I've been blessed enough to say that I've had MANY wonderful Christmas presents throughout my life. One of the best gifts is being able to spend the holidays with my family. My most recent, favorite gift was a Louis Vuitton purse from my husband! Nice Melody! haha Love you. Last year my little sister gave me a 2012 calendar/agenda. But let me tell you, this was not your average calendar. She filled the pages with inspirational quotes, photos and personal notes through out. Everyday over this past year, I've enjoyed flipping to pages to find out what bible verse, picture, quote or note she wrote me! My favorite Christmas present was when we were engaged and Andrew was at my parents house doing our family Christmas. He had bought me some yummy smelling perfume from Victoria's Secret but didn't think to take it out of the big fancy bag with VICTORIA'S SECRET written all over it. lol I'll never forget how awkward that was. Too funny! That is such a special story!! Thank you for linking up!